I cannot believe that this is my last President’s Message that I will write as your TCRA President. It is truly bitter-sweet. Bitter in that serving as President is a commitment, an obligation and, yes, a big responsibility, but yet sweet in that I have had the pleasure of being a part of seeing our association grow and at the same time had the honor and privilege of getting to know some of my fellow reporters on a totally different level. So as I weigh the bitter-sweet, it is the sweet that gives me the ability to say I have absolutely loved serving in this role. As I sit here reflecting over these past two years that I have served as the President of TCRA, I cannot help but think of the good times and many challenges that we have faced and are continuing to face as an organization. My goal, two years ago, was to watch and help TCRA grow and for me to be able to pass down the gavel leaving our association in a better position than when I took the reins. I truly believe that goal was reached and it was done in large part by the hard work of you, the members, and our TCRA board. I have watched our organization grow stronger by the mere fact that our membership has come together and volunteered to serve in so many ways. You guys have done this by embracing the A – Z Program, promoting our profession and encouraging students to enter in to the field of court reporting. Just this week, TCRA and the profession of court reporting was promoted at the Day on the Hill in Nashville. Thanks to Georgette Arena for heading this up, along with the many volunteers that helped make it happen. It was truly a success!! Our members have stepped up to the plate when we needed an extra push to make our conventions top notch. Our members have stepped up and let your voices be heard when we faced struggles, such as the electronic recording in our state criminal courts, an issue that is still pressing and in need of solutions and continued input from TCRA. Yes, a lot has been accomplished but we still have many battles to fight and victories to be won with our profession. Currently a new bill was introduced through the legislature to increase pay for court reporters in our criminal courts, which is a good thing; however we still have a few issues with the bill. Additionally, where does our profession stand in light of the AI community snipping at our heels, an issue we still need to be diligent and proactive to address and be aware of. I say all of that to say, and to add a final note, step up, continue to be a part of TCRA, volunteer, get involved, help make a difference. Experience the bitter-sweet when you are asked to volunteer. In closing, it truly has been an honor and privilege to serve as your president. I will be moving on to my role as past president on the board and working hand-in-hand with the new president. And while I transition out, it is still my continued hope and prayer that TCRA continues to prosper and that the court reporting profession continues to flourish for the many generations to come behind us. P.S. Don’t forget our convention is right around the corner on April 26th and 27th in Chattanooga. We are so excited about this convention and we look forward to seeing you all there. Be on the lookout for blasts to help with auction donations or to sign up for our “First Annual Speed Contest”. 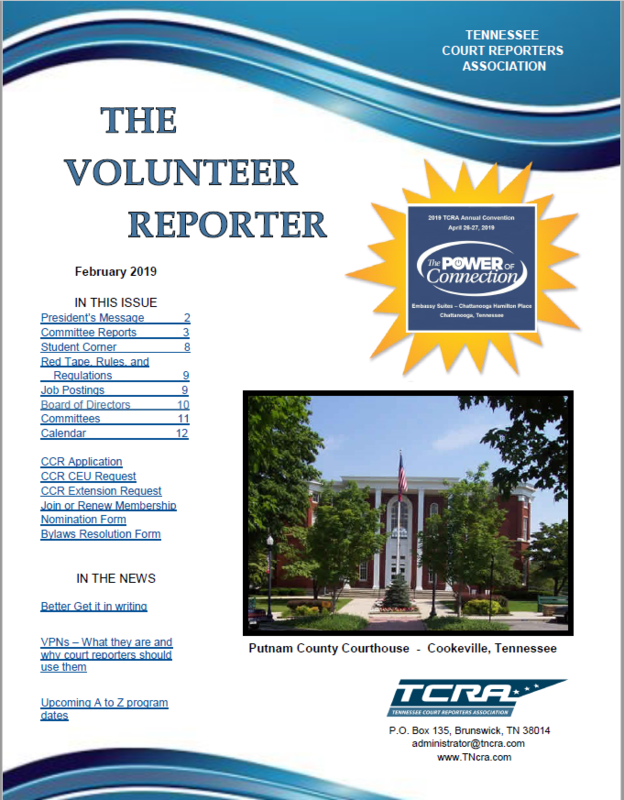 Please read the rest of the newsletter for much more information about what’s going on with TCRA.